Alayê is an Afro-Brazilian group from the state of Pernambuco, in northeastern Brazil, which focuses on percussions, dance, and singing. It’s the first group in Montreal that is devoted to the captivating rhythms of Maracuto, Afoxé, Coco, Ciranda, Frevo, and Candomblé. The group was formed in 2011 by Simon Poitras, a student of Latin percussions at the Cégep St-Laurent, who fell in love with Maracatu while on student exchange in Brazil. Émilie Guérette studied different percussion styles for 5 years in Brazil, Mali, and France, particularly the Pernambucan rhythms. 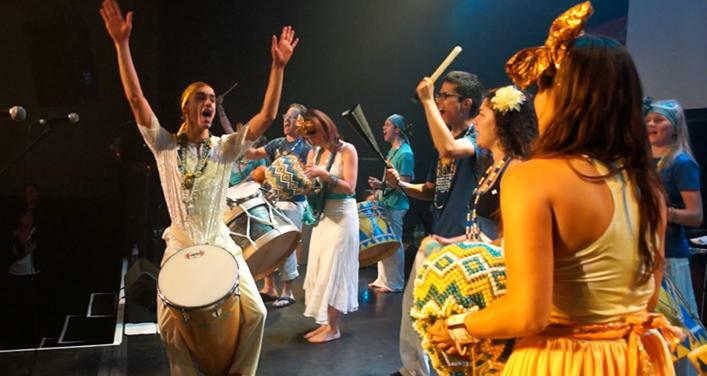 Simon and Émilie decided to bring the Maracatu and Pernambuco cultures to Montreal, and formed the group Alayê, made up of fellow percussionists, dancers, and singers. 2 years later, the group counts a dozen percussionists, 2 singers, and 4 dancers, choreographed by Amélie Nappert. In 2013, Alayê won first prize at the Festival des Percussions de Longueuil and performed in Montreal and New York. Their repertoire includes pieces inspired by the carnival traditions of Recife, which Simon Poitras (musical director) arranges, and their own original songs.